Pain modulation using counter-irritation has been described since the dawn of recorded history. Traditional Chinese needling and heat application methods are thousands of years old. Electricity was applied by the Egyptians using electric fish in 2500 BC and the Greeks were still using it in 400 BC. The Romans were well versed in physical techniques such as hot baths and massage. However, it is only since the development of gate-control theories and the discovery of endorphins in the 1960s that some of the underlying neurophysiological mechanisms have been explained. Those suffering pain after tissue damage commonly describe it as aching, upsetting and poorly localised. The incoming noxious pain activity flowing through the dorsal horn is reduced by inhibitory interneurones, presynaptic and postsynaptic inhibition, and specific receptors controlling ionic flux through nerve membrane channels. Modulatory input to these arrives via two lateral pathways from myelinated sensory Ad and Aß fibres, and via three descending pathways from the midbrain. Aß fibres arise in low-threshold mechanoreceptors (activated by touch, brush, tickle and conventional transcutaneous electrical nerve stimulation [TENS]) and Ad fibres in high-threshold mechanoreceptors (responsive to stronger stimulation such as acupuncture needles). Two pathways descend in the dorsolateral funiculus, the third is associated with diffuse noxious inhibitory control, which is a powerful pain-suppressing system triggered by painful stimulation anywhere in the body. ß-Endorphin is the most important pain inhibitory neurotransmitter in the supraspinal centres and is present in fibres connecting the hypothalamus to the periaqueductal grey. Interconnections between the prefrontal cortex, limbic system (hypothalamus, hippocampus, amygdala, cingulate gyrus) and reticular formation are responsible for the cognitive and emotional influences on the behavioural response to pain. Pain originating in one part of the body can be reduced by strong counter-irritation in another area. The noxious counter-irritant (localised to one body segment) excites a loop, via the Ad fibres, midbrain and descending tracts, to all segments other than that of the noxious stimulus. Many techniques, such as cupping, cautery, skin irritants, painful massage or joint manipulation, resemble acupuncture and TENS with respect to this powerful generalised effect. Incorporates elaborate concepts to explain disturbed body functioning: Qi (the vital life energy flowing along meridians); bodily imbalance in the cosmic regulators Yin and Yang; re-establishment of normal equilibrium by insertion of needles at special points to disperse ‘evil air’. Europeans had been aware of these ideas for several hundred years but it took the reopening of China to the West in 1972 to create a significant upsurge in medical interest. The drive to obtain neurophysiological explanation for the pain-relieving properties of acupuncture has characterised the Western scientific approach. Many modern practitioners no longer believe that meridians or discrete acupuncture points exist, yet they respect the observational skills of the ancient Chinese physicians. They retain the ancient nomenclature and terminology and continue to use many of the powerful needling areas. Only a small number of acupuncturists use exclusively traditional techniques. Trigger points are found in muscles, tendons, ligaments, joint capsules, periosteum and subcutaneous tissues, and are often caused by trauma, repetitive overstrain, emotional upset and excessive cold or heat. They are usually localised to one body region and may produce muscle weakness, shortening, palpable taut bands and fibrositic nodules. Often there is referred pain of a vague unpleasant nature to an area distal to the trigger point, with a pattern specific to each disordered muscle. Deactivation can be achieved by dry needling (acupuncture) or wet needling (injecting dilute local anaesthetic or saline). Superficial needling into overlying subcutaneous tissues may also be effective. This may have a more powerful effect than subcutaneous or muscle stimulation. Typically, the posterior aspect of the transverse process of the neck vertebrae is needled to treat pain in the neck, back or arms; the sacroiliac joint is needled to treat problems in the lower back or legs. The body is divided into segments that comprise a dermatome, myotome, sclerotome and viscerotome, all having the same level of innervation and sensory input into the spinal dorsal horn. The autonomic nerve supply within these segments is important because referred pain from internal organs is localised to the segmental dermatomes and myotomes. Treatment of pain and muscle dysfunction is by stimulating segmental Ad and Aß fibres by pressure, massage, muscle stretching, TENS or needling. For example, chronic gastric or duodenal pathology (thoracic 5–9 viscerotomes) might cause posterior mid-thoracic skin hypersensitivity, paraspinal skin oedema and tenderness over dorsal spines and interspinous ligaments. There might also be secondary myotomal trigger points in the rectus abdominis. Treatment could involve deep needling of the abdominal trigger points and superficial paraspinal needling in the affected thoracic dermatomes. Auriculotherapy is the most commonly known microsystem. It was popularized by Nogier, in France, in the 1970s. He mapped correspondence points in the ear for the entire body and showed it to be represented in a fetal position, upside down, with the head in the ear lobe facing forwards. Nogier noted that physical pathology may be diagnosed by pressure sensitivity and skin resistance changes at the appropriate ear point. Treatment with needles, press studs or electrical stimulation at this point produces analgesia in the distant muscle or joint. Other microsystems have been described in the scalp, face, hands and feet. Reflexology uses massaging of body map areas on the soles of the feet to treat systemic conditions. Electrical stimulation techniques have been used to augment and extend simple needling by allowing a more powerful stimulus to be applied in a more controlled and predictable way. The main stimulation variables of intensity, frequency and duration may be precisely defined. Improvements in skin electrode technology also mean that treatment may be given non-invasively and more comfortably. Whether stimulation is given via needles or skin electrodes, it is possible to target receptors in skin, muscle and periosteum and fine nerve fibrils in subcutaneous tissues and large peripheral nerves where they run close to the skin. This was originally given via crocodile clips attached to needles inserted at traditional Chinese points or into selected segmental dermatomes. The more powerful electrical stimulation has been reported to be more effective than traditional needling, particularly in patients with chronic low back pain, osteoarthritis, myofascial pain and migraine. The intense effect of electroanalgesia is mediated through the central release of endogenous opioids, the chemical structure of which is thought to vary according to the frequency of stimulation (Figure 3). Low frequencies should be restricted to 20 min, because periods in excess of this produce increased levels of the pain facilitatory, opioid antagonist cholecystokinin (CCK-8). When electroacupuncture is used as pre-emptive analgesia for minor operations, or as the analgesic component for balanced general anaesthesia, the benefits may be maximised and prolonged by stimulating at varying frequencies between 2 Hz and 100 Hz. This produces dynorphins and enkephalins in the dorsal horn, ß-endorphin in the hypothalamus and periaqueductal grey, and prevents production of CCK-8. This alternating frequency method has also been used via TENS electrodes applied at Chinese acupoints or segmental dermatomes. It produces an analgesic-sparing effect after lower abdominal surgery and is more effective at high intensities of stimulation. • high-intensity (15–20 mA) and low-frequency (1–5 Hz), thought to work like acupuncture by endogenous opioid release. Recent randomised controlled trials of TENS have demonstrated positive opioid-sparing effects for a variety of surgical procedures. It has also been successfully used for a wide range of chronic pain states. Outcomes and duration of benefit are inconsistent, owing to variable factors, including stimulation site, frequency, intensity and duration. Experimental studies confirm the importance of TENS variables and further research is necessary to optimise settings for specific pain problems. Patients may become tolerant to conventional TENS after weeks to months of good relief. Efforts to avoid this include using complex waveforms, randomly distributed pulses, multiple electrodes and ramped pulses of rising intensity. This was first reported over 30 years ago and recent studies show that it leads to inhibition of pain pathways at the spinal cord level. It is best for neuropathic pain where the nerve lesion is distal to the site of stimulation. Fine acupuncture needle probes are inserted into soft tissues or muscles to stimulate peripheral nerve fibres electrically in the sclerotomal, myotomal or dermatomal distribution corresponding to the patient’s pain symptoms. The periosteum has been stimulated to achieve analgesia in cancer patients with bony metastases. It has also been used for herpes zoster, sciatica, headache and diabetic neuropathy, but long-term benefits for chronic pain disorders have not been established. Recently, some researchers have renamed it percutaneous neuromodulation therapy and suggested that a needle depth of 3 cm is more effective than superficial stimulation at less than 1 cm. This is used widely in physiotherapy and rehabilitative medicine. 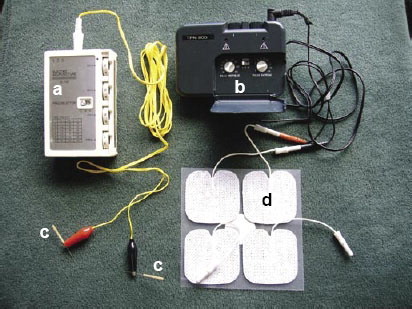 It is a variant of TENS that uses skin electrodes and modulation of the amplitude of the electrical current to minimise the discomfort of stimulating deeper tissues (e.g. muscle). The proposed mechanism of action is through direct stimulation of muscle fibres, rather than peripheral nerves, to improve muscle blood flow and promote healing. H-wave therapy is a variant of TENS in which electrical conduction in peripheral nerves is altered by stimulation of skin electrodes directly above them. It is being promoted for treatment of acute musculoskeletal injuries and has been used successfully for peripheral neuropathies. Piezo-electric current therapy is an investigative technique that uses a more intense stimulus and is said to work via diffuse noxious inhibitory control and the release of endogenous endorphins. Many complementary methods have a segmental approach and produce selective stimulation of Aß and Ad fibres. Physiotherapists use many techniques that stimulate receptors in joint capsules, muscles and skin (e.g. manipulation, muscle stretching, massage, vibration, ultrasonics, hot and cold applications). Patients may be trained to apply acupressure themselves (e.g. pressing directly over trigger points). Chiropractic techniques use sudden thrusts to correct disorders of the spine and joints. Osteopathy has a more holistic approach to restore function and posture via gentle massage and joint manipulation. There are numerous massage styles (e.g. Shiatsu, Rolfing); some are fairly painful and recruit heterosegmental mechanisms. The Finnish sauna, with hot baths, beating with birch leaves and sudden cold immersion, is another example. Laser devices are available (particularly for needle phobics and children) but there is no Ad stimulation, and benefits may be related to tissue-healing properties rather than to pain modulation. Despite a vast literature on counter-irritant techniques, there are few good quality randomised controlled trials. Systematic reviews have provided ambivalent evidence and have demonstrated multiple methodology faults. It is unfortunate that therapies which are in such widespread use are so difficult to evaluate scientifically. It is common for patients with chronic musculoskeletal problems to achieve relief and functional improvement lasting weeks or months after a single 10-minute acupuncture session. Professor Han of Beijing has proposed that there may be a reverberating mesolimbic loop of analgesia involving midbrain structures and periaqueductal grey to maintain descending modulatory activity. Somatotopic convergence within central CNS structures is assumed to be the anatomical explanation for the various microsystems; the exact mechanisms are unknown.